If you love the idea of a wedding ring made from recycled metal but need to careful about how much you spend, you could choose machine pressed (or die struck) wedding rings instead of having them handmade. Each wedding band is made to order and is finished by hand. We source our machine-pressed rings from Hoover & Strong (a US-based eco-refiner) and they’re all made with certified 100% post-consumer recycled precious metals. Whilst we love the idea of handmade, often there are good reasons to start with a die-struck ring – especially if all you need is something simple. You can choose to have a polished or brush finish or you can add your own touch such as engraving or (if the ring is thick enough) setting small diamonds or gemstones. 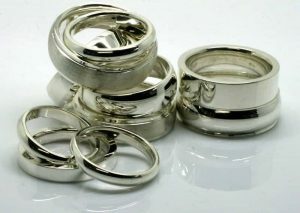 Machine-pressed rings are a lower cost alternative to Australian handmade ethical wedding rings. They also offer a less expensive base for adding personal details such as engraving. Unlike casting, which can cause porosity and other weaknesses, machine pressing creates strong rings. Hi Melinda. We went and picked up the rings today. They’re lovely and exactly what we were after. Thank you very much for all your help during the whole process. You were so easy to work with, and we really appreciated always being kept in the loop. How much do machine-pressed rings cost? Below are our price ranges for standard half round or flat bands (with a comfort fit), 2 – 6mm (generally 1.4 – 1.7mm thick, except ‘heavy’ flat bands which are 2mm thick as standard) in sizes 5 – 10 with a polished or brushed finish. *engraving, diamonds and other embellishments can be added at extra cost. Rings are usually available in 10, 14 and 18 carat white (nickel free), yellow and rose gold, palladium and platinum in sizes 4 – 12 (Australian H 1/4 – Y). Some styles can be custom ordered in sizes and widths other than those stated. Which metal is right for you? There are a number of things to think about when choosing the right metal for your rings. This blog article explains the traps and pitfalls for the unwary. At EJA, we’re big fans of recycled precious metals. In fact it’s pretty much all we use. These two blog articles, one about gold and the other about the platinum group metals, explain why. Want a quote for machine-pressed wedding rings? Before we can give you a meaningful price, we need to know a couple of things. In particular your preferred design and your ring size. When you contact us (email or phone 07 3379 2596), make sure you request a free ring sizer and provide us with your mailing address so we can post it to you.